Home Archive by category "Blended Learning"
We were talking about this curve over a cup of coffee when something struck us – technology adoption is not the real challenge, nor is adopting a new solution. Instead we frame this challenge as the ability to adapt to changing needs and conditions in our schools, of our teachers, in our classrooms and in the minds of our students. For the past few years we have been talking about and reading about blended learning models that are primarily based in effective utilization of technology platforms as tools for moving the needle on instructional effectiveness. What struck us is that maybe that is not the right problem to solve, or maybe that the conversation about blended learning needs to take a leap forward from implementing platforms and models to the acts of teaching and learning. 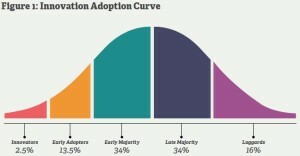 In innovation and technology adoption we often hear about the innovation curve illustrated here. Out front are those on the bleeding edge, followed by those on the cutting edge, those on the trending edge, those on the following edge and those on the un-involved edge. We have been exploring a different notion – that blended learning is a great idea and we have spent many years as innovators in blended learning, however it tends to focus on technology based solutions and the reliance of those solution on platforms doesn’t do as good a job as we need them to on the very personal part of teaching – that multi-sided collection of dimensions that go into the teaching/learning relationship between teachers and students, nor the complexity of leading – supporting consistent growth in teaching and learning. The emerging notion we discussed is based in the concept that all learning is blended learning and that a different view of the innovation curve might be illustrated by changing the labels a bit so that instead of thinking about this as an illustration of innovation in education, perhaps we should view it as an illustration of effectiveness in blending current skills and knowledge with new skills and knowledge. In this case the point where one might locate current status on the curve is in effectiveness in blending prior and current learning resulting in new learning. This puts the innovators on the blending edge – those who are out front in growing student learning in ways that work for the students’ benefit. We are most certainly not anti-anything but have worked through enough technology implementation projects to feel certain that technology provides great tools but technology alone doesn’t produce the results we are seeking. The same can be said of any other innovation – better time management, realignment of authority or budgets, rewriting and realigning the standards, adoption of frameworks, etc.. We see the challenge as better blending all of those things in a more focused effort on the learning needs of students – in another word – personalization. Unfortunately many of these efforts end up as functionally renewing the factory model we are trying so hard to displace. 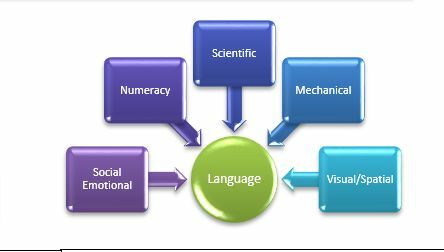 One way of thinking about this is in terms of capacity – presuming that where an educator, a school, a school leader finds themselves on this curve is primarily a function of capacity, the challenge is one of developing the skills and understanding to expand capacity to engage in more and better opportunities for blending learning. Our approach to this has been modeling an inquiry approach to openly exploring the possibilities and methodically, Socratically working through local solutions, focusing on outcomes rather than answers, functionally an organizational and individual capacity growth strategy. We have walked the halls and talked with the teachers and school leaders of hundreds of schools. We have worked with this strategy in dozens of schools. Yet we have yet to see anything approaching a sure fire fix. The number of failed implementations is disheartening. The quantity of time, funds, effort, innovative ideas, frustrated teachers, leaders and students, points to how difficult it is to match the scope of the problems with solutions. But we have also seen it work in schools serving every kind of neighborhood. In a way, the failure problem parallels the same one we so often hear about students – they aren’t trying hard enough, or don’t have the pre-requisite skills, or the conditions just aren’t aligned well enough to achieve the expected outcomes. We have seen this as effectively a lack of will to reach far enough, functionally the grit challenge. How can we engage school teams in effectively taking on building their capacity to reach that far? This is what we do – walking the halls, sitting in classrooms, offices and meeting rooms, asking questions, sharing thought provoking resources, seeking to blend prior understanding about the tasks and responsibilities of teaching and leading with the growth of new skills and understanding about what is possible and how to make it work to expand the options and possibilities for students.